The essays in this insightful collection reflect on the relationship between thinking, emotions, and actions in the authentic Christian life, showing how all three are mutually interdependent. Contributors include Rick Warren, Francis Chan, John Piper, and R C Sproul. About "Thinking. Loving. Doing. (Unabridged, 4 Cds)"
The Christian life is more than thinking--but not less. And it's more than feeling--but not less. It's more than doing as well--but never less. Healthy followers of Jesus engage their minds, hearts, and hands in glorifying him. 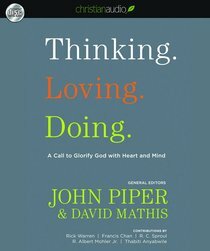 This volume, built on the 2010 Desiring God National Conference and John Piper's recent book Think: The Life of the Mind and the Love of God argues that thinking and the affections of the heart are inseparable. Our emotions fuel our thoughts for God. Likewise, hard thinking about God leads to deeper joy in our relationship with him. And both, in turn, help us focus outward as we express a greater love for others. Contributions by Rick Warren, Francis Chan, John Piper, R. Albert Mohler Jr., R. C. Sproul, and Thabiti Anyabwile bring a wealth of perspective and experience in calling for readers to love God and others with heart and mind and hands. Thabiti M. Anyabwile is senior pastor at First Baptist Church of Grand Cayman in the Cayman Islands. Thabiti has a strong professional and educational background in community psychology, with special interest in the history and development of the African American church. Anyabwile is a contributing writer to 9Marks and the author of The Decline of African American Theology, What Is a Healthy Church Member? and The Faithful Preacher: Recapturing the Vision of Three Pioneering African-American Pastors .